Are you seeking to add an element in your drapery window or door track? If yes, then you are at the right place. Here we have innovative drapery tracks that will get your visitors marveling at the awesome tracks. We bring to you flexible drapery track. With this type of track, you get to design your own track shapes, which can be inspired by the window shape, or simply by the designs you love. Flexible tracks provide an opportunity to create designs that are not only revolutionary, but also expressing yourself. Either way, you end up spicing up your house interior décor. Flexible drapery tracks are made of several materials. The most common are either metal or resin. For flexibility, aluminum is the most common metal. Actually, the flexibility of the tracks is so high such that you fit then into your desired shapes through bending with your hand. However, don’t misinterpret this. Even though they are flexible, they are very firm. There are both light and medium flexible drapery tracks. Choice is based on the intended use. If you need them for room partition, then you might require the medium as the size of the curtain to be used is big, meaning more weight. For windows and doors, the lightweight tracks are suitable. On average, these lightweight tracks carry 33 pounds of weight. 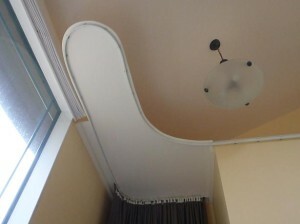 The flexible track can be mounted on the wall or on the ceiling. Regardless of the material used, they are easy to mount. Actually, so long as you are physically fit, the process is a DIY task. All the items required for the process are availed through the packaging kit. Nevertheless, you can select on the items you need if you don’t want to purchase the entire kit. For more details on how to buy flexible drapery tracks, contact theflextrack.com now.